According to the rules of the Olympic Games, watchmaker Richard Mille will announce the name of his new envoy from the world of sports only three days after the closing ceremonies. However, the company decided to thoroughly intrigue his fans and the entire time the world, presenting a new model, which will sprint on the wrist while running. Watches are made in a typical industrial style of the company, equipped with a tourbillon and presented in a case with a contrasting green bezel and crown. The brightness of the green hour indexes and complementary strap Velcro ®, made in not less than bright yellow hue. 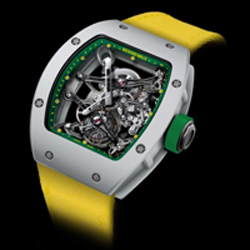 Company representatives noted that Richard Mille plans in 2013 to provide other than new envoy his new manufactory caliber.